i want to extract ghost recon future soldier game models but i couldn't find any extractor. so any ideas are more than appreciated. idstring "[ GEAR BigFile ]"
savepos CRC_OFF         # crc of the filenames? get DUMMY string    # or byte? Filenames hashed (CRC32). Look .report file to get original file names. woooow thank you Ekey you really made my day . thanks again Ekey you rock . Seems it's other BIG format. it did the same thing for me . i think they offset the archive packaging . we need someone good at scripting ho can write a script so we can extract it . you're using it with wrong big file. try it with files in Sound_Bin_PC folder. Any idea how to unpack/pack yeti.BIG files in main dir? Thanks to reply. I tested it on all 4 YBIG archives and it didn't work. looks like theirs a problem with the script . please aluigi resolve this problem . I finally found a way how to unpack Yeti.big, Yeti.big1, Yeti.big2, Yeti.big3 archives. Open Yeti.big and goto offset (byte=1487572640) or (hex=58aa8ea0). Open Yeti.big1 and remove first 65536 bytes then copy rest of bytes and paste it on offset of Yeti.big (byte=1487572640) or (hex=58aa8ea0). Open Yeti.big2 and remove first 65536 bytes then copy rest of bytes and paste it on offset of Yeti.big. (byte=2975102352) or (hex=b1547590). Open Yeti.big3 and remove first 65536 bytes then copy rest of bytes and paste it on offset of Yeti.big. (byte=4463445720) or (hex=10a0ac6d8). Now you can save your file as Yeti_1.big and use bms script to unpack it. 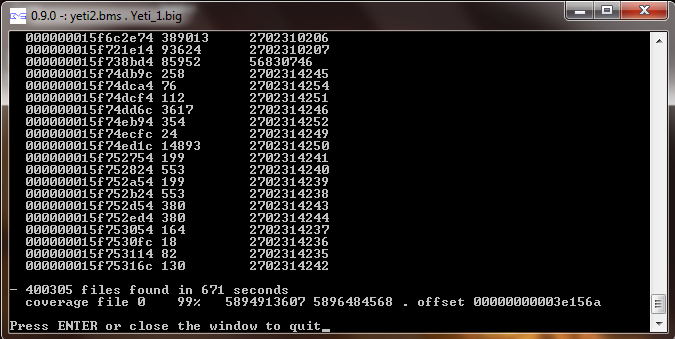 Overall size of created archive Yeti_1.big must be 5896484568 bytes. If not then you did something bad or you have wrong version. Tested on 1.8 version of the game. Not Steam one. GRiNDERKILLER wrote: I finally found a way how to unpack Yeti.big, Yeti.big1, Yeti.big2, Yeti.big3 archives. Thanks in advance! Which program do you use to open them?